Jakopi Tofu is one of dozens of Japanese tofu dishes. 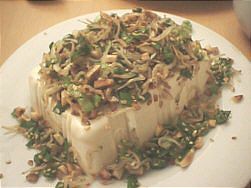 It is tofu covered by a topping made of small chirimenjako fish and peanuts. It is a side dish that can be prepared within five minutes. * May not be available in Western supermarkets; but you should be able to find it in Japanese grocery stores that exist in most large European and American cities. Cut green onion and peanuts in small pieces. Heat up sesame oil in a fry pan. Add peanuts and chirimenjako into the pan. After about two minutes, add the green onions and sesame seeds into the pan. After friying for another two to three minutes, spread the Jakopi on the tofu and serve. Add soya sauce as you like.